Narendra Modi seems to have kick started a storm in our political discourse with his ‘Taking Bath With A Raincoat’ metaphor for Dr. Manmohan Singh, his predecessor. Though there can’t be any denying on the fact that Dr. Singh, after 10 years of service as the Priminister of this country, left a very bad legacy, his equivalence being drawn to a mere ‘Raincoat’ begs some analysis. To add to it, the grievance that the Congress camp is orchestrating all around needs a massive thump down. For me and may be many more, Congress as a party should be the last to teach anyone on decency and respect. Whether Modi was right or wrong in calling the earlier PM as a helpless and mute spectator to the crimes of his regime can be and should be debated but Congress showing this sudden love and respect for MMS is certainly hilarious. Congress basically stands on two grounds – a borrowed surname and an equally notorious first family. Not to forget the sycophants with pea size brains swarming the daily ‘Darbar’ and do ‘Ji Hazoori’ for almost anything. The ecosystem that these sycophants and their masters have built over the decades of rot piling also contributes handsomely for the very existence of the party. Traditionally, the first and the only motto of this political outfit is/was to serve the first family. In pursuance of this filthy goal, the sycophants have achieved many milestones in skulduggery and abject dishonesty, both towards the nation and their own party men who appeared as a threat to the family. Even great leaders like Lalbahadur Shastri or a certain Sardar Patel aren’t dear to them because they were too big characters to even engulf the false notion of the Nehru-Gandhi clan. The respect these charlatans show to someone like Netaji Subash Bose, who also was the president of their party at one point of time, needs no elaboration. Now when these same louts turn around and lecture us on how one should respect an ex-Priminister or for that matter any political leader of significance, one tend to look at the sky in dismay. Let’s go to the era when Sitaram Keshri was the party president. Just to put Sonia Gandhi at the helm of affairs, the jokers didn’t even mind locking the old man inside a toilet till their AICC meeting was over. I myself have seen video clips of many Congress men who were shameless enough to claim their hand in the mega kidnapping effort to sabotage the prospects of old Sitaram Keshri. And it was that day and it is today and nothing has changed. They infact have scaled little lower in sycophancy level. Sycophancy has gone so prominent that the grand old party never had any internal election to elect their party president after that. Narashimha Rao is another instance that reflects a lot on the shoddy behaviour of Congress men. Mr. Rao could easily feature in the list of top three PMs of this country but that is not what excites these sycophants. A certain Narasimha Rao shouldn’t be part of the Congress legacy as he may ruin the otherwise dubious image of Chinese Gandhis. The poor man never got a state burial. His dead body was never allowed to be taken inside the Congress headquarters, a party which he headed and represented in the union cabinet. His mortals remained dumped in the morgue of AIIMS till his family members with help from AP government did the arrangements for his body to be taken to his home town. Not a single top leader from Congress attended his funeral and these scumbags now are teaching us how respects should be shown. As I said, utterly laughable. History of Congress is full with rot. The more you excavate the more twaddle it will throw up. That said the mess they piled during MMS’s 10 year governance is something that was never witnessed in our political history. It would still be an understatement to call Dr. Singh’s tenure as the most corrupt era in the history of our nation. The nation was looted left-right-and-centre while Dr. Singh conveniently looked at the direction of 10 Janpath for instructions. People do term Dr. Singh as a puppet but I disagree on the sole point that it still is an insult to the puppet clan. Puppets do at times react but one never would remember Dr. Singh reacting to anything, including the national plunders that his ministers and party-men were doing. Had I not seen Dr. Singh walking on his own, I would have disagreed to accept that he carries any spine. In 10 years he would have said as many times, and quite shamelessly at that, he is ready to resign from his post the day Rahul Gandhi agrees to take the job. Being the PM of the nation he allowed a non-constitutional entity like NAC to come up where Sonia Gandhi along with her trusted ‘Darbaris’ called the shots while the PM himself was rendered redundant by design. The revelation that all important files from PMO were routinely ferried to 10 Janpath for Sonia Gandhi’s approval is the kind of shame that no PM of any country would agree to withstand. But MMS was and perhaps still is a different case study it seems. He not only was ‘spineless’ in proverbial terms but also was shameless enough to be proud of his spinelessness. That is what TIME magazine picked up beautifully. 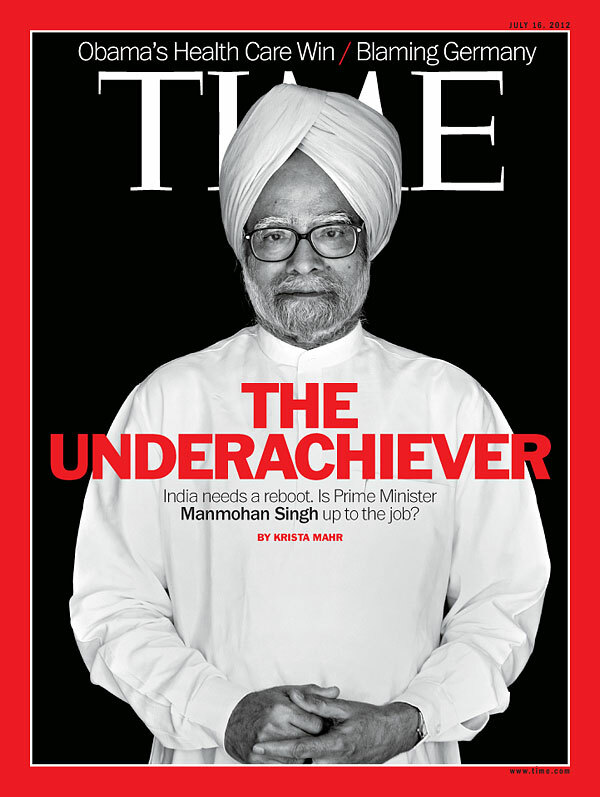 In fact, being an international magazine, they had to be politically correct, but a headline like ‘The Spineless Underachiever’ would have made much more sense. 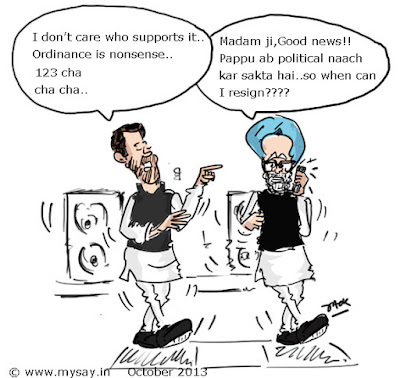 Dr. Singh quite willingly turned himself as an ignominy to the chair he was holding. For some reason, Sonia Gandhi was allowed to walk-in to his office without any prior appointment and the man in question, I am told, was always seen standing at the gates of his office to welcome this persona non grata. In true sense, Sonia Gandhi was running her kitchen cabinet while Dr. Singh at best fitted to the role of the chief Butler. The same man who never had the guts to call the wrongs happening right under his nose is now very vocal about everything. Shamelessness goes bankrupt when he calls demonetisation as disgrace and terms the current PM with similar adjectives. That is like Suresh Kalmadi addressing someone as a thug. No disgrace occupying Shastri Bhawan could ever manage to scale over Dr. Singh but the man who should rather be ashamed of his dubious feats is running around funny and calling everyone else a disgrace. Such an embarrassment, I tell you. The basic of articulation and debate is missing with Dr. Singh too. When you are adventurous enough to criticize someone, you better be prepared to take few criticisms on your own; more so when you have only filth to your credit to write home about. This is also true with the Congress party as well. I would call it hypocrisy when you fill your lungs with toxic waste and start fuming when somebody questions your rotten past but find no offence in using choicest of abuses on others. You can't have both the ways. When you abuse be prepared to take the abuse. Little point in taking a high moral ground when morality is the least percentage component in your characteristics. 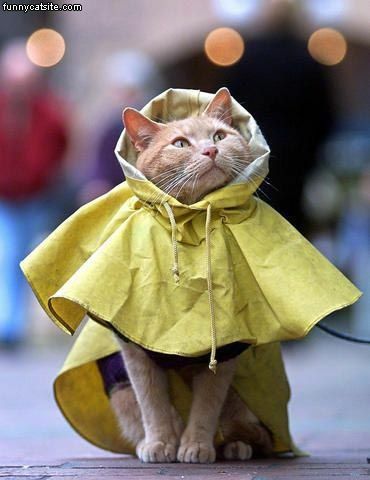 But hang on; we will get to this point little later. Coming back to Manmohan Singh again. Let alone the queen, even the retard brat wasn’t far behind in insulting the man in MMS and the chair. While the spokies of Congress are all over the place in shedding crocodile tears, they shouldn’t forget the humiliation that the same MMS received in the hands of a worthless and brainless hack. In first of its kind a joker was allowed to gate-crash the official press conference of the government and call the ordinance approved by the PM as ‘Nonsense’. And these guys are now weeping inconsolably for a man who was insulted time and again by the queen and her family during his regrettable tenure. Just to show a failed jerk as a person, who can take tough calls, the party readily allowed the PM to be dubbed as nonsense and Ahem …. Ahem, we now have the same clowns orchestrating drama and dishing out booklets on respect. Cartoonists seldom miss the point and here too, the nexus in projecting RG as a tough nut and MMS as a shameless slave to accept every humiliation on his strides like a true ‘Darbari’, isn’t missed. And here I am not making my words since the same spineless MMS was seen praising RG at the next AICC meeting and calling his ‘Nonsense’ outburst against the ordinance as the signs of a true leader wishing all the good for the nation. And the same MMS along with the hordes of Congress sycophants expect all of us to shower MMS with all the respect of the world. Post the remark of Modi, the reaction of Congress largely appears quack. The vehemence of Rahul Gandhi in demanding an apology from Modi for something which can’t be denied by facts is little short of foolhardiness. Criticisms are exchanged on the floor and as a political party you need to learn the art of accepting it. Criticizing an ex PM for his crimes is unjustifiable in RG’s world but using phrases like ‘Khoon Ki Dalali’, ‘Maut Ka Saudagar’, ‘Butcher Of Gujarat’, ‘Hero Of Hatred’ for an incumbent PM and that too publicly is perfectly fine. Where was RG vacationing when the leader of opposition almost used ‘Kutta’ for the PM? His own mother goes around the town with transcripts written in Italian while mildly sounding like Hindi and uses terms as derogatory as they can be for the current PM? But today RG has his nickers on fire since somebody called a spineless slave in as many words. When it was required the most MMS choose to remain silent and wait for the text messages on his mobile and today the same MMS is busy churning out all possible garbage that he could. Where he had lost this courage and voice when he was gleefully acting as a proxy to the powers that be of 10 Janpath? The economist in him never took the plunge when the economy depleted or the exchequer was looted no end and today, the rejuvenated robot is having a field day in accusing every other person on the planet. For those morons who are equating being soft spoken as one being dignified – there is no dignity in presiding over a corrupt regime there by looting the nation indirectly in connivance with your cohorts. There is no dignity in keeping silent when you had all the powers of the world at your disposal to curtail the national loot going right under your nose. There is no dignity in being rendering oneself as a spineless slave. There is no dignity in admitting that you are a stopgap warming the chair and waiting for the day when your master agrees to occupy it. And of course, there is no dignity in being vocal on someone else’s actions when you did absolutely nothing or worst, engaging in covering national crimes, when it was your time. To Rahul Gandhi, who all of a sudden finds boycotting the PM for fun is a very dignified and gracious thing to do – your own father once publicly called Dr. Manmohan Singh a JOKER. Go figure if you can.